Why Southern Sound and Lighting? Whether you are a concert promoter, a festival producer or the chair of the county fair hiring the right production company to handle the entertainment can make or break your event. Live entertainment draws the large crowds and keeps people at your event – thus keeping your food, beverage and merchandise vendors happy. The longer the crowds stay at your event or festival the more money they will spend, thus giving all of your sponsors a greater return on their investment with you. There are many elements to producing a successful event and it starts way before the festival gates open. When you hire a professional production company like Southern Sound and Lighting, we will ensure you have the right audio, lighting, staging and video that will fit your needs. We will help you determine your audio needs based on the size of crowds you are expecting and the technical riders of the entertainment you have hired. If you need us to communicate with the bands and tour managers we can take care of that for you too. The team at Southern Sound and Lighting has not only managed festivals but have also been on nationwide/international tours , so advancing shows and navigating contracts is something we would be happy to help you with. Lighting packages can be customized to any needs. Depending on the times of the festival or event and the hired entertainment, we have many options to fit any needs. Lighting has become an important aspect to the fan experience. Not only is the quality of the sound important – but the lighting of the event plays a major factor. At Southern Sound and Lighting, we have keeping up with the latest technology when it comes to moving lights. Our team can design a custom look for your event using a variety of lighting options. Make all the pictures of the event stand out with an awesome lighting package! If you need a stage for your event, we can help with that too! We have mobile stage options along with custom built stages using Stage Right Stage decks that can be configured to almost any size. It is important to look at the quality of the stage and roof and how well it has been maintained. Every promoter uses pictures and videos from the event/festival/concert to promote next year’s event. The quality of the equipment makes a difference to sponsors and the overall look and feel of the event. Video is an important part of the experience for large concerts, festivals and events. Video boards allow fans and spectators to get up close views of the entertainers on stage…even if they are not in your VIP pits. Like sound systems and lighting packages…there are many different video options with different size screens or video walls. Not only are there different configurations and hanging options, but there are different ways for the video crews to capture all the important moments. Video is vital to the promotions of future events in showing spectators and sponsors the feel and mood of the event. 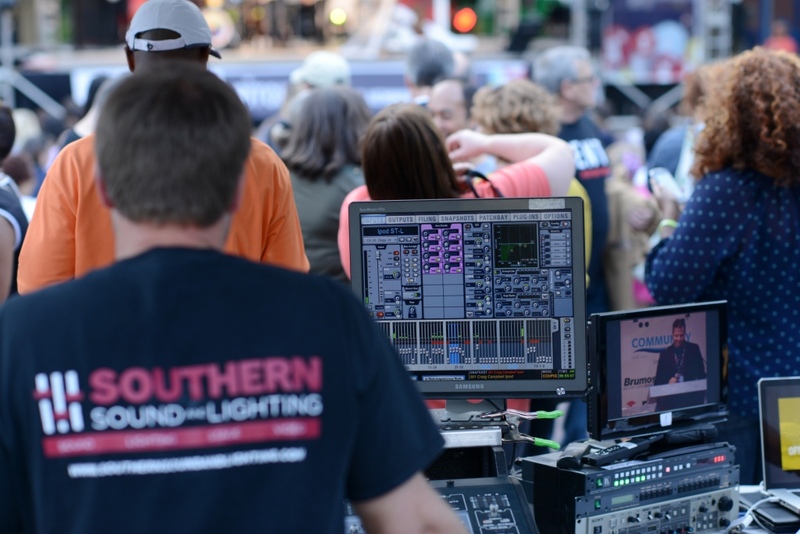 The team at Southern Sound and Lighting would love to help you with your next concert, event or festival. We promise to use our years of experience and knowledge in helping you create and/or maintain a quality event. Our philosophy is to build long term relationships with all of our clients. It is imperative for our clients to feel like we are part of their team in making their event a success. You can always depend on us for fair pricing, quality equipment, great service and excellent advice! If you are not our client, call us today for a free quote!